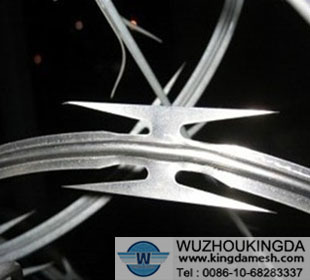 Razor wire can be a very effective way to protect your home or business and the valuables inside from intruders, but it must be handled with extreme care to avoid serious injury to yourself and others. Because it is considered a potentially dangerous deterrent, check local ordinances to make sure razor wire can be installed in your area. Before installing razor wire, buy a pair of razor wire gloves. Do not use other types of gloves because they might not be be as sturdy. Also put on safety glasses before you begin the installation process. 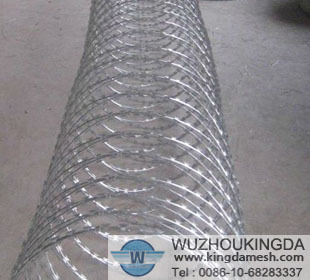 Measure the fence or wall where you want to install razor wire. 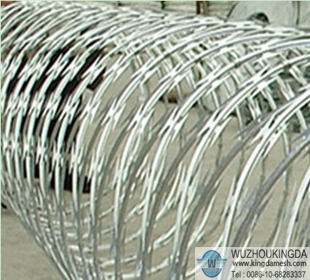 Boundary Fence and Railing Systems recommends only attaching razor wire to fences and walls over 8 feet tall. The company also recommends that razor wire not be installed near any pedestrian foot traffic areas and be installed "in a highly visible manner." Install the razor barbed wire on top of a fence or wall by first installing a wire bracket every 1 to 2 feet. 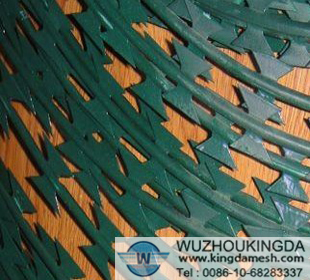 After the brackets are installed, slowly feed, or stretch, the wire into the brackets and secure the wire so it does not slip or fall out of place, which could cause injury.